Pro Disposal is proud to have been selected by the Highlands Ranch Community Association to be the exclusive preferred trash & recycling provider for the Highlands Ranch community. We go above and beyond to provide exceptional service to each of our customers. Our trash service was voted Best of the Best for 2017 in Highlands Ranch by the Colorado Community Media Readers. This is just one testament to our excellent staff and service that goes above and beyond. Additional 95-gallon containers have a $25.00 delivery fee. Highlands Ranch customers enjoy Pro Disposal recycling included in their low monthly service fee! Pro Disposals single-stream recycling solutions offer a convenient way to make recycling part of your daily routine. Whether you are new to Highlands Ranch or have been a resident for the last 30+ years, Pro Disposal is committed to help keep the community a beautiful place to live. From the Highlands Ranch Mansion to Redstone Park, Pro Disposal is committed to helping reduce our communitys carbon footprint, learn more about our values. If you have questions about your existing service in Highlands Ranch, contact us, and reference the links below for more information about our Highlands Ranch trash & recycling services. 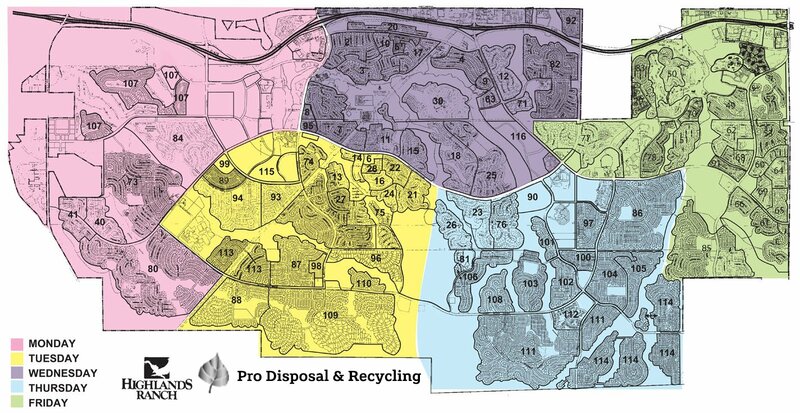 See the below map to determine your trash day in Highlands Ranch. Click to view the full-size map or view our convenient street finder.